Whenever a person is considering starting a MLM home based business, I always recommend they do some extensive research before “jumping in.” You want to make sure the products are good and priced fair. You should review the leadership behind the company. And one of the most important things you should research is how you get paid… The company compensation plan. In today’s post, we are going to look at the top 10 cool facts of the USANA compensation plan. But first, let me tell you a little about USANA. USANA Health Sciences was founded in 1992 by Dr. Myron Wentz. Based in West Valley City, Utah, USANA manufactures and sells nutritional and dietary supplements as well as skin care products. The company uses a multilevel marketing business format in which independent USANA representatives sell the products and recruit other representatives. USANA is a public company listed on the New York Stock Exchange. Now, here are the top 10 cool facts about the USANA compensation plan. Retail Sales – USANA gives independent representatives a preferred price and the rep can then sell the product at the retail price. The average markups are 10-12%. Weekly Commissions – As a USANA representative, your goal is to also recruit other representatives into your downline. You can then earn weekly commissions off their sales. 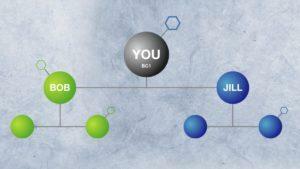 Matching Bonus – If you are a USANA Pacesetter and you recruit a Pacesetter, you get a lifetime matching bonus. USANA uses a binary compensation plan. This means you have 2 legs under you. All your recruits will go below you into one of these 2 legs. The best way to win with the binary plan is to keep your legs as even as possible. The USANA compensation plan pays you commission on the volume of the smaller leg of the 2. Before I explain this, do keep in mind the cost to start a traditional business. You could owe $500,000+ just to get one rolling. With USANA, you just need to activate a single business center. You need 200 points to do that, so you need to order that much. The easiest way is to order a business starter pack for $305 which gives you many USANA products to try and use. Or you can simply order products until you reach the 200 points. Once you have that, you are active and can start earning. To keep your business center active, you need 100 points in personal sales volume every 4 weeks. Order products for yourself or for others and deliver to stay active. With the USANA compensation plan, you can have 3 business centers. This gives you more “punch.” Your main business center is the top and your other 2 will be directly under you leading your right and left legs. By doing this, you will have 4 downline legs instead of 2. This can be confusing, but in most binary plans, you lose any points gained in your “high” leg. You just get commissions on your lowest leg. With USANA, the extra points with your high leg rollover to the next period. Let’s say your low leg generates 1600 points and your high leg generates 2000 points. You will get paid on the 1600 and 400 points will rollover to the next commission period. Earlier I said you can have up to 3 business centers… But guess what? Once you have generated 5,000 points on both the left and right sides of your business center, USANA will give you a voucher to open another business center you can place beneath either your left or right side. You will not earn commissions off their sales, but you can get preferred customers who purchase product at preferred prices. These preferred customer sales will count toward your group sales volume. USANA has many incentive programs for home based USANA representatives. These may be luxurious vacations, nice prizes and even extra cash. Just participate and you can gain any of these incentives no matter your level. When asking any USANA representative about their compensation plan, I hear unanimous exclamations that are positive. While no compensation plan is perfect, USANA has one that is close. Just post any and all below. Disclaimer: Neither Online MLM Community nor I are affiliated with USANA. This information is provided as a service for your education. That’s really cool facts for Usana compensation plan. I have a friend of mine who was not into MLM before but decided to give up his small business and focus in selling and recruiting here in Usana. Now, he earns more and reached the director position. He also enjoys the travel and luxurious vacation in cruise as you mentioned in your #10 cool facts.